Last year, a global team of creative researchers and art directors got together to predict where our visual minds would wander over the next 12 months, and six months in can already see how these trends are increasingly prominent among brand marketing. The team analysed data from millions of images searched on Getty Images, and tracked how these visuals are used – from advertising and movies to social media and magazines. Outsider In – the trend of visuals pushing the envelope and breaking tradition as popular taste gets more daring. Secret Deodorant released an instalment of #StressTest ads that saw one courageous woman manouver her way through an unconventional proposal, giving us a glimpse as something we don’t see everyday. Android’s ‘Be Together, Not The Same‘ ads inspire a similar angle. Extended Human – the trend of blurring man and machine in images, as a result of humanity’s growing relationship with technology. As technology continues to surpass even the furthest reaches of the average person’s imagination, so do brands and their visuals. Case in point is the spot from National Multiple Sclerosis Society, who’s spot featured surf legend Steve Bettis, who after being diagnosed with MS is now confined to a wheelchair. But thanks to new tech, he’s able to virtually experience the thrill of riding a wave while seated in his own chair at home. Divine Living – as brands focus on values, reflection and revelation become more important in accompanying visuals, with consumers looking for more meaningful consumption. Rising concerns like health care, climate change, conscious consumerism and politics has seen brands adopt more meaningful marketing that inspire more than just a ‘want’ in consumers. Getty references Tourisme Quebec’s ‘Blind Love’ spot, which took US musician Danny Kean, who was blind from birth, on a trip to explore Canada, but from a different point of view. Messthetics – brands are starting to harness the power of ugly, messy, sweaty, visceral aesthetics, in a kind of rebellion against the ‘order’ of everyday life. 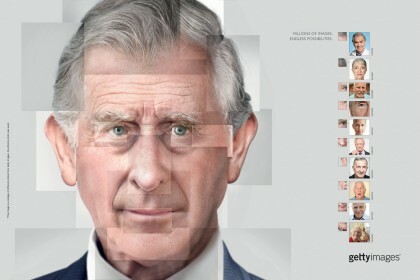 For this one, think Getty Images’ own spring campaign with AlmapBBDO, ‘Endless Possibilities’, which uses stock-art image libraries to assemble identifiable portraits from nothing but its own creative database. Silence VS Noise – the trend of making space for consumers to breathe and reconnect in a cluttered marketplace through what Getty Images called “visual haikus”. For this trend, Getty points out graphic minimalism abound in a number of spaces, from Years & Years’ music video for ‘Desire ft. Tove Lo’, as well as Harper’s Bazaar’s cover story featuring Jennifer Aniston in striking yet subdued portraits. Another great example is this impeccably simple advertisement for Swedish e-payment brand Klarna, called Smooth. Surreality – the trend of expanded creativity and surreal graphic imagery that lets brands play with ideas of infinity and multiplicity. Getty Images alludes to Stella McCartney’s Summer 2016 campaign, which left viewers guessing where one model ends and another begins. Japanese miso soup brand Marukome and its campaign ‘Kawaii’ also hit the mark with this trend.